29 mm stainless steel case, stainless steel bezel with Bulgari logo, sapphire crystal, black dial with checkered pattern texture, quartz movement, stainless steel bracelet, folding buckle. Water resistant to 150 ft.
29 mm stainless steel case, screw down crown, black rubber coated stainless steel bezel with Bulgari logo, sapphire crystal, black dial with checkered pattern texture, quartz movement, black rubber strap, tang buckle. 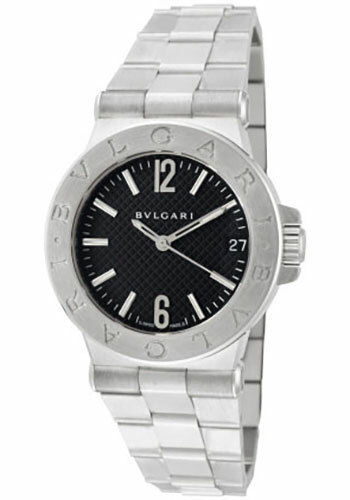 Water resistant to 150 ft.
29 mm stainless steel case, black rubber coated stainless steel bezel with Bulgari logo, sapphire crystal, silver dial with checkered pattern texture, quartz movement, stainless steel bracelet, folding buckle. Water resistant to 150 ft.
29 mm stainless steel case, screw down crown, black rubber coated stainless steel bezel with Bulgari logo, sapphire crystal, silver dial with checkered pattern texture, quartz movement, black rubber strap, tang buckle. Water resistant to 150 ft.